Fascinating Chronological Chart of the Bible following Bishop Ussher's schemata. Leonard's Chronological and Geographical Family Guide to the Holy Bible. 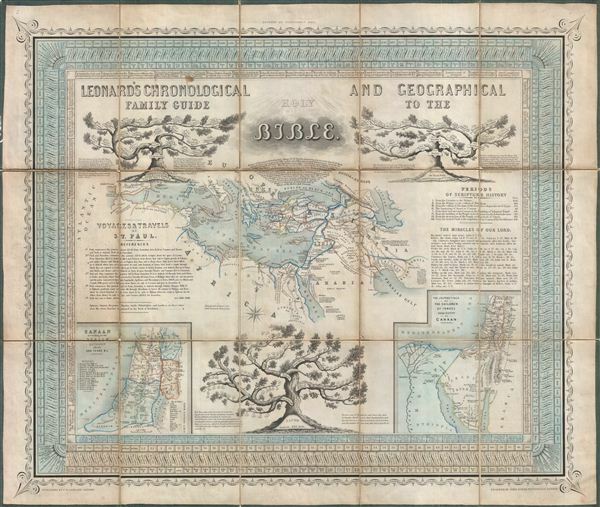 A charming c. 1850 map, chart, and chronological guide to the Holy Land issued by C. W. Leonard. Following the schemata devised by Bishop Ussher of Ireland this chart illustrates the history of the Bible from October 23, 4004 BC, the supposed exact date of Creation. At the center of the chart is an overview map of the Mediterranean basin covering from the Straits of Gibraltar to the Caspian Sea and from the Black Sea to the Persian Gulf. Secondary maps illustrating Canaan according to the Syrian Division of 200 BC (with Biblical mountains noted) and the 'Jounreyings of the Children of Israel from egypt to Canaan' appear in the lower left and right quadrants, respectively. The chart additionally features three family trees – those of Jacob (bottom center), the Kings of Judah (upper left), and Jeroboam (upper right). Surrounding the map, what appears to be an embellished decorative boarder is in fact a fascinating timeline dating the events of the Bible according to the Usscher Chronology. The outer border offers notations on the dating system as well as handy conversions between weights and measurements of antiquity and the english system measurements common in the 19th century. The whole was engraved by for C. W. Leonard by John Dower of London. John James Dower (June 1, 1825 - 1901) was a well-respected mapmaker, print seller, and publisher based in London, England. Dower is the heir to the more prominent London engraver and mapmaker John Crane Dower (1791 - 1847). Dower worked with many prominent middle to late 19th century London map publishers including Weller, Cassell, Bacon, Petermann, and others. He was elected to the Royal Geographical Society in 1854. Dower also published on maps his own account including one atlas and various school geographies. In addition to his cartographic work, Dower is well known as an engraver of military scenes. Very good. Dissected and mounted on linen. Original linen in good condition. Some wear to linen and map along original fold lines. Spot of what appears to be paint affecting the linen edging, upper left quadrant.